It's already happened. I only lasted four episodes before I got to Alfa Romeo, but it was kind of like the elephant in the room. When many people think of the best European cars they think of Alfa, and this one in particular, the Brera, is the car I want you to all think about. Originally, the Brera was shown as concept car based around a Maserati engine and platform in 2002. Rumour has it that the Brera was never intended to actually go into production but the demand Alfa Romeo got was so intense they were forced to give in and order their designers to find a way to put it into production. Thankfully they found that way. 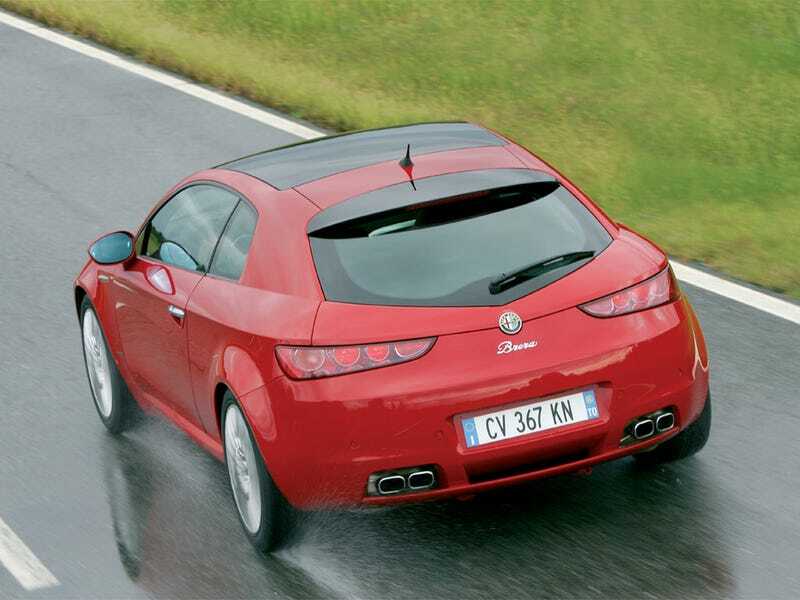 Fast forward three years then, and Alfa Romeo show the world their production ready version of the Brera. It had been scaled down into a smaller car based around the Alfa Romeo 159 platform which it was being developed alongside, but crucially it had kept the concept styling almost to the point where it was identical. So no sonorous Maserati V8's inside that beautiful body then, that would have to wait for Maserati themselves to do a few years later. Not that it mattered though because the Brera came with some pretty nice engines to choose from, the pick of which was clearly the 3.2l v6 producing 260bhp. You could also have it with a diesel engine if you wished, but I always felt a diesel engine in a body that beautiful kind of spoiled the allure a little bit. That's just my humble opinion though, and I've never been a big diesel fan. You could also have it as the coupe or as the Spider, which is perfect for cruising around the coast in the sunshine. Either of these cars has real road presence though and still to this day stands out as a exceedingly beautiful machine. Upon its launch here in the UK this was a very expensive car. If you bought one in its most basic form you'd be forking out £23,000. However, nobody buys a car like this to have one just plain basic, and with options and engines and trim levels, if you ended up going totally crazy (and having one too many espressos at the Alfa dealership) you could end up paying over £36,000. What did you get for your money though? You're getting a Giugiaro designed concept car still, that's always worth bearing in mind. It's also a 2+2, not really a sports car more of a GT. It's very comfortable and above all else enjoyable to drive, and blessed with beautiful styling both inside and out. The early 3.2 V6's were only available as 4WD so that means great grip to go with a beautiful engine note too. It has decent storage space for a car of this nature, even if the boot isn't particularly well designed. You don't buy a car like this for those reasons though. Inevitably, reliability questions always come up with Alfa Romeo but this car actually had no clear issues reported with it over it's production lifespan. It's a very reliable car and as long as you properly maintain it, it shouldn't let you down. The Brera was up against some tough competition in it's day, the Audi TT in particular was very popular, and you could make a strong argument that the Porsche Boxster and even the Mazda RX8 were rivals for the Brera. To prolong the life of the Brera, and to improve some criticisms of the handling, a new Brera 'S' model was released and a new turbo petrol engine were made available from 2008 onwards. The 'S' was worked on alongside the clever guys at ProDrive, and featured tuned suspension and little tweaks to change the handling dynamics of the car. These are fairly rare machines and from what I understand they are the Brera to have if you ever get the chance to buy one. When it's all said and done, you buy this car because it's a wonderful cruiser. Engineering, pah! Who cares? You want this car to drive around in and feel great everyday. You're not going to drive this like a racing car, you're actually going to drive this around rather slowly and thoughtfully, just enjoying the sensations of the journey. If you're lucky, you'll have a beautiful lady in the passenger seat and some hot sunshine on one of those glorious days by the coast line. That is what this car is about. Capturing the essence of that one perfect day we get in our lives when everything goes our way. It's the car for that one day. That's why it's one of the very Best of Europe.